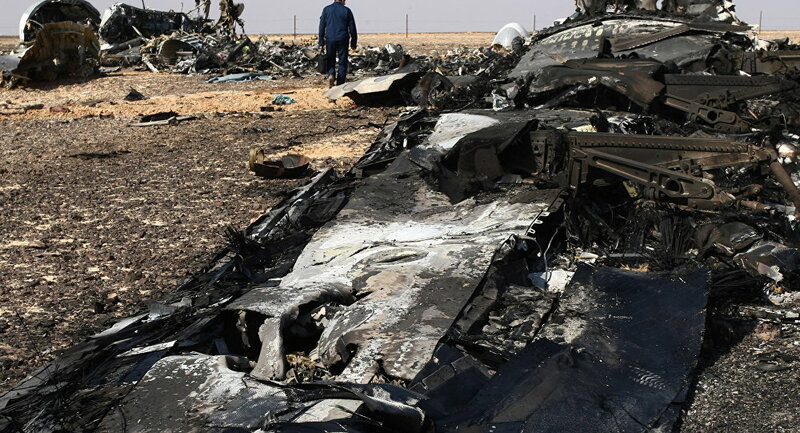 According to an Egyptian forensic expert, an analysis of injuries sustained by victims of the Russian airliner crash on Saturday in Egypt shows that a mid-air explosion might have occured aboard the Airbus A321 passenger jet, RIA Novosti reported. On October 31, an Airbus A321 operated by the Russian airline Kogalymavia crashed in the Sinai Peninsula en route to St. Petersburg from the Egyptian resort city of Sharm El-Sheikh. The tragedy has become the largest civilian aircraft disaster in Russian and Soviet history. "A large number of body parts may indicate that a powerful explosion took place aboard the plane before it hit the ground," said an Egyptian forensic expert who took part in the examination of the bodies of the A321 crash victims. According to the expert, a DNA analysis would be needed to identify the victims of the Russian airliner crash in Egypt. Earlier in the day, members of the investigation committee on the Kogalymavia's flight 9268 catastrophe in Egypt have taken part in a meeting at the crash site. The committee includes experts from Egypt, Russia, France, Germany and Ireland. According to Egyptian President Abdel Fattah Sisi, the investigation could take several months.